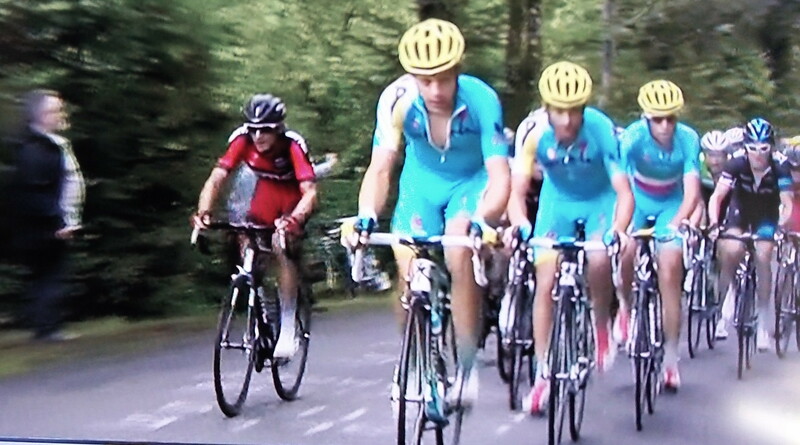 Glued to the TV: Stage 10 of the Tour de France. This July is a tough month to get any work done, and no, it’s not the weather. First it was the World Cup in Brazil that deserved a certain amount of attention. And no sooner was that finished, with a splendid result, it’s Bastille Day and Stage 10 of the Tour de France. This was the day that Alberto Contador, the tough little Spaniard and one of the big favorites to win this year’s tour, was forced to withdraw from the race. He crashed and was hurt too badly to continue. On cable, NBC Sports is carrying the race live each morning and repeats the broadcast immediately after the live coverage is done. Then there’s another repeat at night. So you can see why there’s not a lot of time for much else, especially if you want to squeeze in a ride of your own. I’d probably have a greater interest in “The Tour” if they had to use the same bicycle throughout and perform their own repairs/maintenance. They break a bike and someone just hands them another one from one of their 3 semi trucks full of equipment.